Alexander Benderskii, associate professor of chemistry and senior author of the new study in Nature. 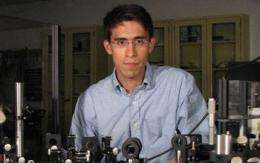 (PhysOrg.com) -- Air and water meet over most of the earth's surface, but exactly where one ends and the other begins turns out to be a surprisingly subtle question. A new study in Nature narrows the boundary to just one quarter of water molecules in the uppermost layer  those that happen to have one hydrogen atom in water and the other vibrating freely above. Such molecules straddle gas and liquid phases, according to senior author Alexander Benderskii of the University of Southern California: The free hydrogen behaves like an atom in gas phase, while its twin below acts much like the other atoms that make up "bulk" water. The finding matters for theoretical reasons and for practical studies of reactions at the water's surface, including the processes that maintain a vital supply of nitrogen, oxygen and carbon dioxide in the atmosphere. "The air-water interface is about 70 percent of the earth's surface," Benderskii said. "A lot of chemical reactions that are responsible for our atmospheric balance, as well as many processes important in environmental chemistry, happen at the air-water interface." He added that the study provided a new way for chemists and biologists to study other interfaces, such as the boundary between water and biomembranes that marks the edge of every living cell. "Water interfaces in general are important," Benderskii said, calling the study "an open door that now we can walk through and broaden the range of our investigations to other, perhaps more complex, acqueous interfaces." In their study, Benderskii and his colleagues used techniques they invented to test the strength of hydrogen bonds linking water molecules (from the hydrogen of one molecule to the oxygen of another). These are the bonds that keep water a liquid at room temperature. Specifically, the researchers inferred the bond strength by measuring the hydrogen-oxygen vibration frequency. The bond gets stronger as the frequency decreases, similar to the pull one feels when slowing down a child on a swing. In the case of straddling molecules with one hydrogen in water, when compared to bonds below the surface, "the hydrogen bond is surprisingly only slightly weaker," according to Benderskii. Likewise, the bond for the hydrogen atom sticking out of the water is similar in strength to bonds in the gas phase. The researchers concluded that the change between air and water happens in the space of a single water molecule. "You recover the bulk phase of water extremely quickly," Benderskii said. While the transition happens in the uppermost layer of water molecules, the molecules involved change constantly. Even when they rise to the top layer, molecules for the most part are wholly submerged, spending only a quarter of their time straddling air and water. The study raises the question of how exactly to define the air-water boundary. If the straddling molecules constitute the boundary, it would be analogous to a wood fence where three of every four boards are missing  except that since water molecules always are moving between submerged and straddling positions, the location of the fourth board would change millions of times per second. If the boundary were the entire top layer of water molecules, the analogy would be a fence where one in four boards is sticking out at any one time. And his announcement perfectly portrays what is wrong with politics these days: People who are effectively technologically abd scientifically illiterate are trying to lead countries whose economy is largely dependent on technology and science in one form or another. "If this isn't pork, I don't know what is." said Bobank. Yes: He definitely does not know what pork is.